I’ve been doing a lot of praying for blue skies. Winter seems to be lingering in Upstate New York. The air has a bitter bite to it’s blow and the grey clouds mask the sun entirely. Everyone is sick of the dreariness, myself included. I’m counting down the days to a fresh pedicure and flip flop season. 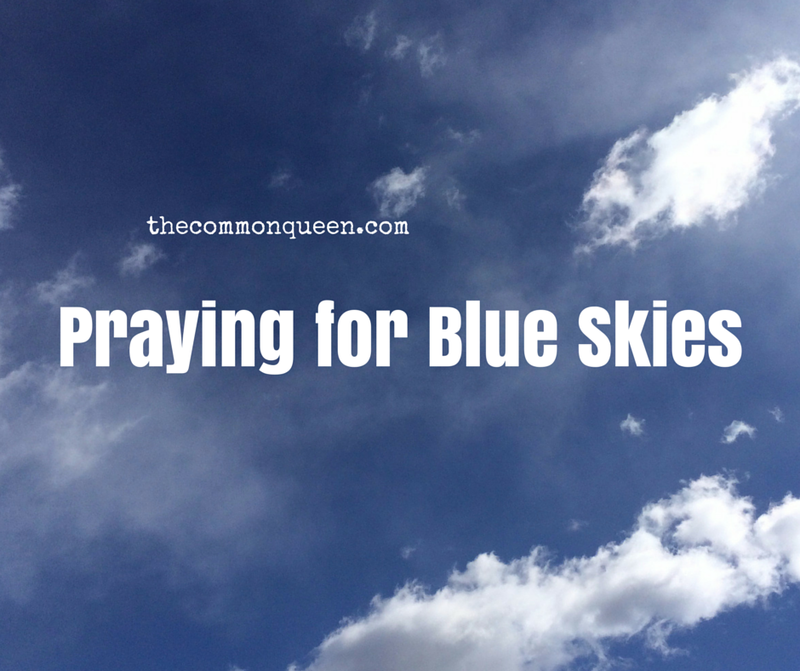 The blue skies I’m praying for aren’t merely physical. It’s been hard to get out of bed lately. The snooze button has become my morning companion and my mental math has greatly improved. I can barely form comprehensible sentences in the morning (ask any of my previous roommates), but I can add 9-minutes to the current time in a jiffy. And I’m not just talking about hitting the snooze once or twice, but for an hour. AN HOUR. The lack of motivation goes far beyond just getting out of bed. It has bled into every (if not all) areas of my life. Including writing. Every time I sit down to write I feel like I’ve gone dry….as if the last article I wrote would be the last article I’d ever write. It’s been as if there’s just nothing left to say. Maybe I’m not really a writer, but I’ve been living on some borrowed grace. I was sitting at my desk typing late one night, when I looked down at my hands and noticed a spot that I had never seen before. It could have been the poor lighting, or the fact that my eyes were tired (isn’t that an old person excuse?! ), but I could definitely see a spot. An age spot. I had already been noticing some grey strands trying to hide between my blonde locks. In an attempt to hide them, I decided to make a slight change in where my hair parted. No one else can see them, but I can hear them laughing maniacally and calling out, “I’ll get you my pretty!” like the Wicked Witch of the West. At a recent family dinner, I was struck by how mature my 14-year old niece was looking. She was wearing long dangly earrings and there was a faint shimmer on her cheeks. Make-up was once used for dress-up and now she’s using it for real. Like for real. What happened to her holding me hostage on the couch to read…and then re-read…every Berenstain Bear book she owned? Then, talking to my mom that same night, I remembered this year marks 10 years since I graduated from college. That might have been the final straw. From my lack of motivation to the intense sadness at realizing I’m getting older to feeling like I’m always going to be in this rut– all I’m seeing right now is cloudy skies. I’ve been praying and crying and praying some more begging God for some relief. While running some errands this week, I started praying again. As I drove, there were grey clouds ahead of me and grey clouds in my rear view mirror. I was surrounded. Passing an airport, I noticed an airplane taking off and I began remembering the different times I had flown. Each time, the same thing happened. Eventually, we’d get above the clouds and above the clouds there was sunshine. Glorious sunshine. On the ground, the clouds may have shielded the sun from me, but once above them there was nothing hindering my sight. Here below, it may look like there’s no sun at all. Miles in every direction you may see nothing, but clouds, but I can assure you there is still a sun. It shines big and bright and warm. It’s everything you remember it to be and more. Just keep climbing. Don’t level off at a lower altitude before you’ve broken through the clouds. I know things are hard right now, but this is all temporary. Your current struggles are your future victories, but (as much as you want to) you can’t give up. You’ve got to hold on to Hope as a lifeline– constantly pointing your face towards the sky for the moment that the break in the clouds finally comes. But for now, as we stare at the clouds, this is my prayer for you and me (taken from Numbers 6:24-26): The Lord bless you and keep you; the Lord make his face to shine upon you and be gracious to you; the Lord lift up his countenance upon you and give you peace.